The opening of Kenilworth Station has been delayed until February next year, it has now been confirmed. Despite sources informing the KWN the opening was delayed, Warwickshire County Council only confirmed the news today (Monday December 4). While the construction of the £13.6 million station is close to completion, a train for the service will not be available until February. Joint managing director of the council Monica Fogarty, who in a previous interview claimed the Transport Secretary Chris Grayling MP had promised a service would be available, blamed the Department for Transport for the latest delay. She said: "The Department is unable to supply the train and drivers in order to meet the December opening date, and this is beyond disappointing for the people of Kenilworth. "The County Council so wanted to be able to deliver as promised on this exciting scheme for Kenilworth and we share your disappointment. That said, two more months, having waited 53 years is not long, and it will be worth the wait. "I want Kenilworth to know that your council, county councillors and MP have all worked until the last minute to try to persuade the DfT to deliver and it is such a shame that this has not proved possible." Speaking to the KWN after her initial statement, Monica the council had been in talks with the DfT about delivering the station on time until Friday December 1, when she 'threw in the towel'. She added: "Up until that week, it was still doable. When we got to last week, we thought we've got to let people know what's happening." This is the third time the station has been delayed. The original opening date was December 2016, then August 2017, then December 2017, and now February 2018. And with costs now reaching £13.6 million for a station which will provide an hourly service between Leamington and Coventry, Monica denied the station's construction was a mistake. She said that although the service will be hourly to begin with, she was confident increased demand would encourage the station and train operators West Midlands Trains to increase the frequency of its service. And when asked whether anyone could now trust the revised February date, Monica added: "We're at the mercy of the rail industry to some extent. It's only as definite as the promise." 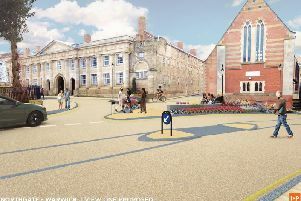 In response to the news, town councillor Richard Dickson said: "To have delayed this £13 million project once (from last December to August this year) was a misfortune. To have delayed it a second time to December 10 looked a bit like carelessness. Now to delay it a third time is beyond belief. "To make matters worse the county council has chosen to cast all the blame on the Department for Transport. "To say that Kenilworth has waited 53 years and that another two months won't hurt displays an out of touch arrogance that is beyond belief. "This is the single biggest inward investment in the town for decades. Kenilworth residents demand better from its County Council, its staff who are paid to manage such huge projects properly and its County Councillors who are elected." The DfT has since issued a statement in response to the council.